Earth Bar is a fantastic nutritious little juice bar just off Santa Monica Boulevard when you want a healthy treat on a hot day. It’s perfect to grab and go or stay and chill for a bit. There’s a little front bar where you can relax and sip your beverage. The employees are always super friendly and are great at making suggestions for you. One employee suggested the Acai bowl because I told him I wanted something healthy but more than a juice. It was basically this humongous bowl of blended Acai and almond milk. It was delicious! 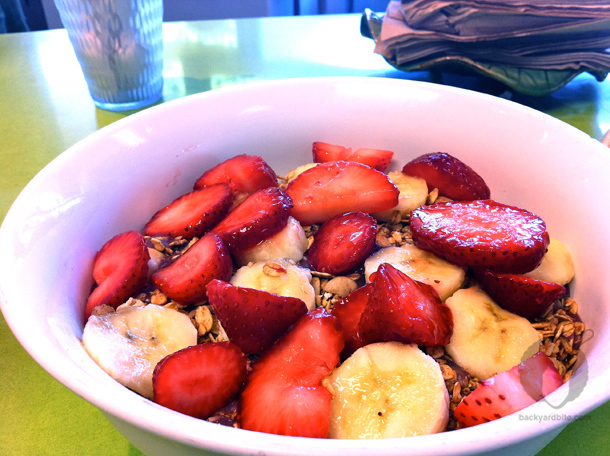 It was really cold and sorbet-like and came topped with granola, strawberries and bananas. The Acai Bowl is more aesthetically pleasing in the to-go container, otherwise they give it to you in this huge bowl and it looks like mush after you start to dig in. It is so refreshing though! I recommend sharing it or adding some almond butter or trail mix to it. It’s 9 bucks so it’s a bit more expensive than a juice or blended beverage but is a mildly sweet, healthy little “ice-cream” for when you are in the mood for something different. After I started to dig in… Goopy, but goooood and refreshing! They also recommended this blended beverage for something a bit heartier. It’s got banana, organic raw almond butter, almond milk, vegan protein, and homemade granola. If you are just in the mood for something fresh and light and simple, grab an Apple, Carrot, Ginger Juice. It’s freshly made and they don’t skimp on the ginger. It’s delicious! There’s a nice selection of supplements, Superfoods and nutrients at Earth Bar. They are really great about helping you get the right stuff for your bod! I’ve never had a vitamin B-12 shot here, but if you’re sick, this is the place to fix you up fast. BYB Tip: Come with a hangover, leave with a smile.